City of Rocks National Reserve in Southern Idaho is a rock climbers dream come true. Named in 1849 by James F. Wilkins who was a westbound immigrant on the California Trail after he saw the rock formations that reminded him of a city. 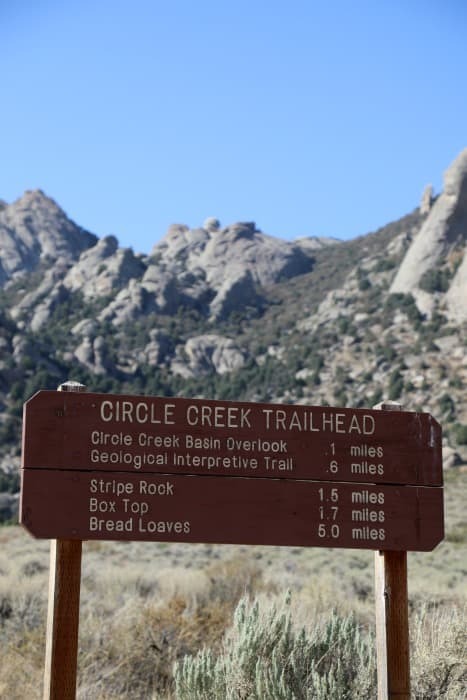 City of Rocks has more than 700 rock climbing routes through out the park. Some of the granite spires and domes are more than 2.5 million years old. The park also offers hiking, biking, and horseback trails. The park also includes Idaho’s largest forest of pinon pines. The visitor center is best place to start your visit. You can check in if you are camping, ask about rock climbing, watch a film on the area, and pick up a junior ranger program. 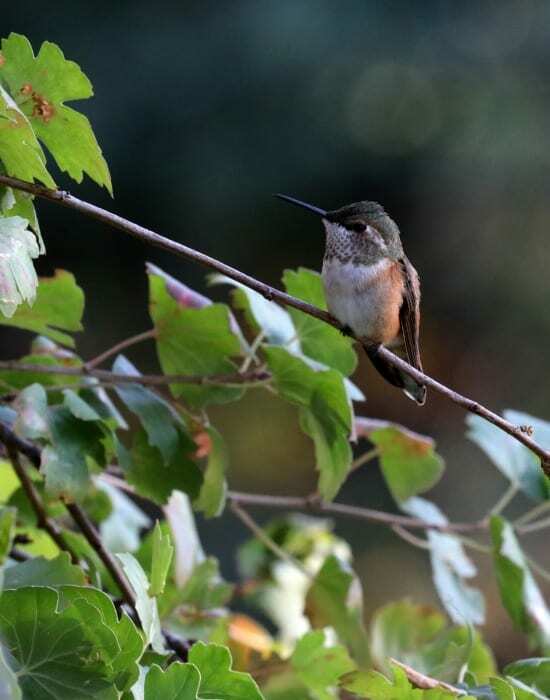 While we were at the visitor center we saw a ton of Rufous Hummingbirds and Black Chinned Hummingbirds. There are two feeders right by the front door and they were everywhere. We went back after the visitor center was closed and were able to photograph them. 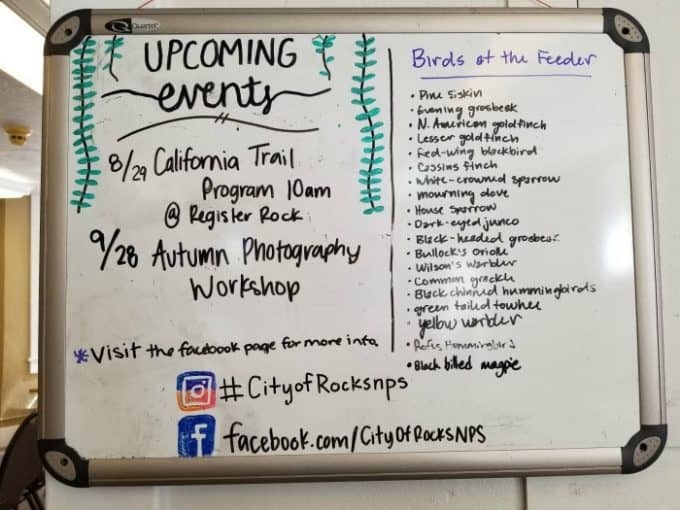 Check out the wipe board in the visitor center to see which birds have been seen at the feeder. 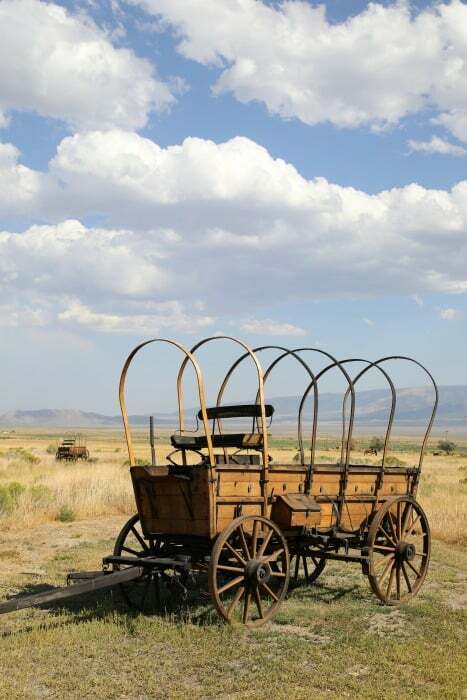 Check out the replica California Trail Wagon outside the visitor center. 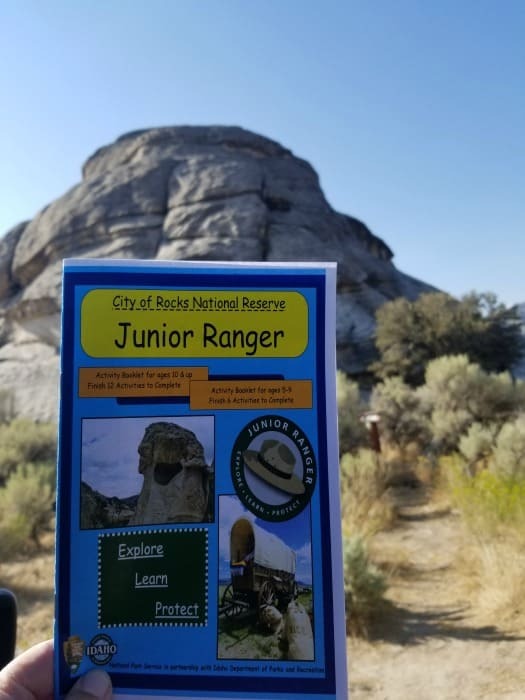 The Junior Ranger program takes you into the park and gives you the chance to learn more about the area. 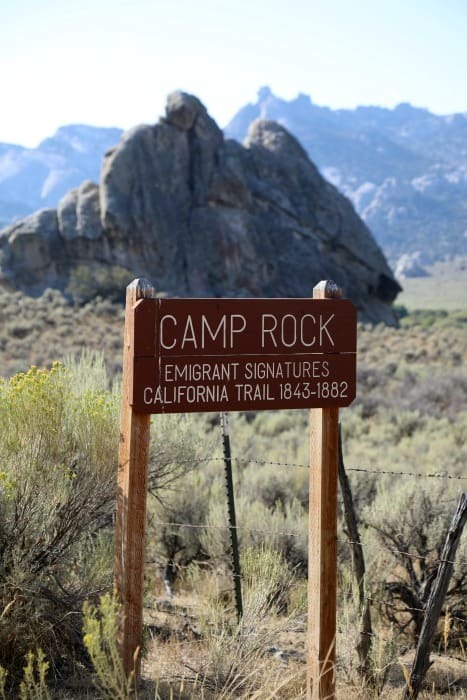 One of the cool things you can see in City of Rocks is the signatures of emigrants traveling on the California Historic Trail. 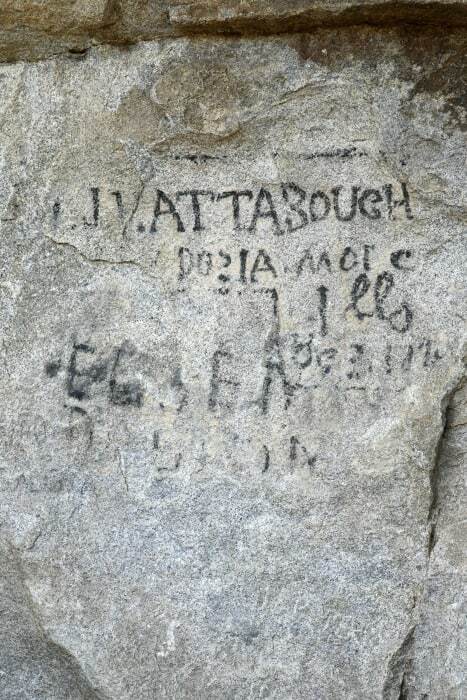 The signatures were left in axle-grease from 1843-1882. 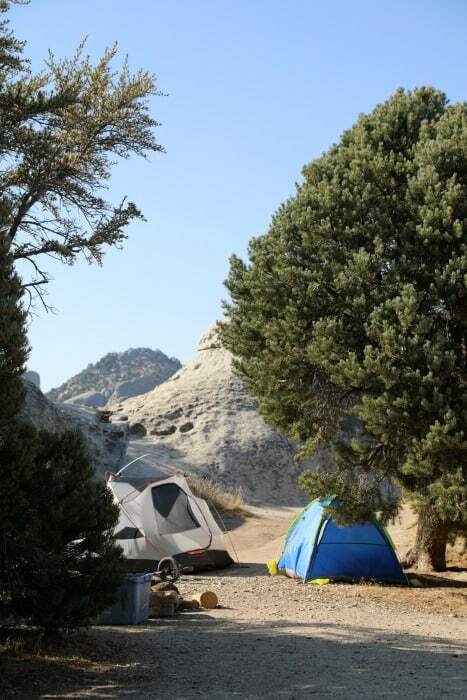 City of Rocks has 64 campgrounds within the park. One of the cool things about these campgrounds is some of them are pretty spread out from other campgrounds. You can feel like you have the entire park to yourself. All campsites have fire rings and picnic tables. Clean vault toilets are located in central areas, and drinking water (April-October) is available at Bath Rock and Emery Pass Picnic Area. Campsite fee are $12.72 per night. 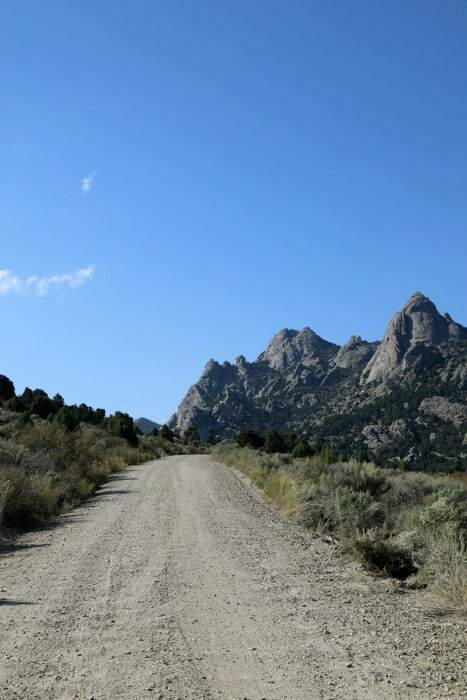 Explore the gravel roads of City of Rocks NR! Keep an eye out for wildlife and rock climbers. There are only a couple of main roads through the park so it is really easy to explore. 173 bird species have been documented in the checklist area have been documented! This is a great park to see Pinyon Jay, Virginia’s Warbler, Gray Flycatcher, Juniper Titmouse, Bushtit, Greater Sage-Grouse, Black-throated Gray Warbler, and Plumbeous Vireo. From Boise: take I-84 East to exit 216 (Declo); go south on Highway 77 to Conner Creek Junction; turn right (west) on Highway 77 Spur to Almo. 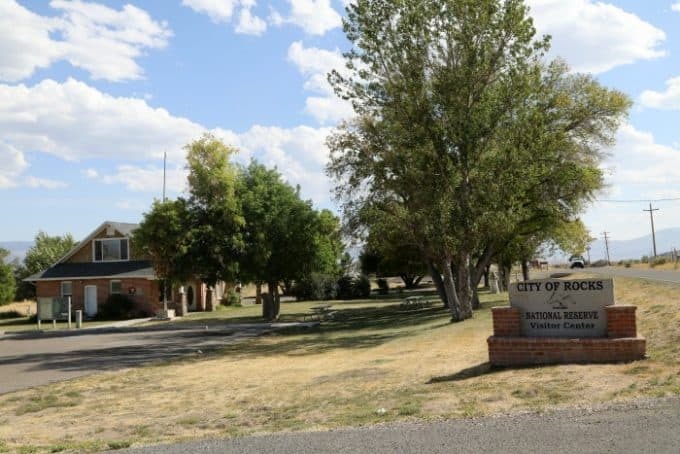 The visitor center and the park entrance are south of the post office and businesses. From Pocatello: take I-86 West to I-84 West to exit 216 and proceed as above. From Salt Lake City: take I-84 west to exit 245 (Sublette), turn left and go west to Malta. Driving from Salt Lake City: take I-84 west to exit 245 (Sublette), turn left and go west to Malta. From Malta take Highway 77 to Conner Creek Junction, continuing straight west through the junction the Highway becomes 77 Spur. Take Highway 77 Spur to Almo. The visitor center and the park entrance are south of the post office and businesses. Call the City of Rocks Visitor Center at 208-824-5901 for the latest road conditions. The park is open 24 hours a day 7 days a week. Some roads may be closed due to weather in the winter. 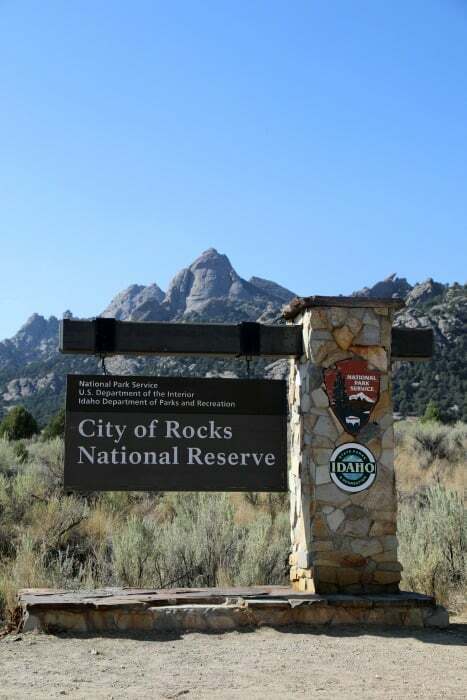 The visitor center for City of Rocks National Reserve and Castle Rocks State Park is open 8 a.m. to 4:30 p.m. Tuesday through Saturday (closed on Sunday, Monday and legal holidays).